I frequently find myself wondering what life is like for the various animals I find scurrying around me. When I was out for a walk just a few days ago, I encountered a box turtle walking across a field. I walked right up to it and it didn’t seem to mind my presence. It just kept walking. I love peaceful animals like that turtle. I stooped down beside it and looked right at its face. It was such a beautiful creature. The designs on their shells are really something. This turtle had orange stripes on its face, and its skin looked almost as if someone had purposefully decorated it. When my face was right up next to its own, it was startled and went into its shell and hissed at me. Once I stood back up it came back out of its shell and continued its migration across the field. It looked a lot like the turtle in this picture. As my new found friend left me, I thought to myself, “What do you do all day, Mr. turtle? You too live within the brain in your small skull as well, I presume. I wonder how aware of this world you are. What do you know? What do you think about?” I have no idea how turtles spend their day, but I’d be interested to know. You know though, turtles really are ungrateful creatures. 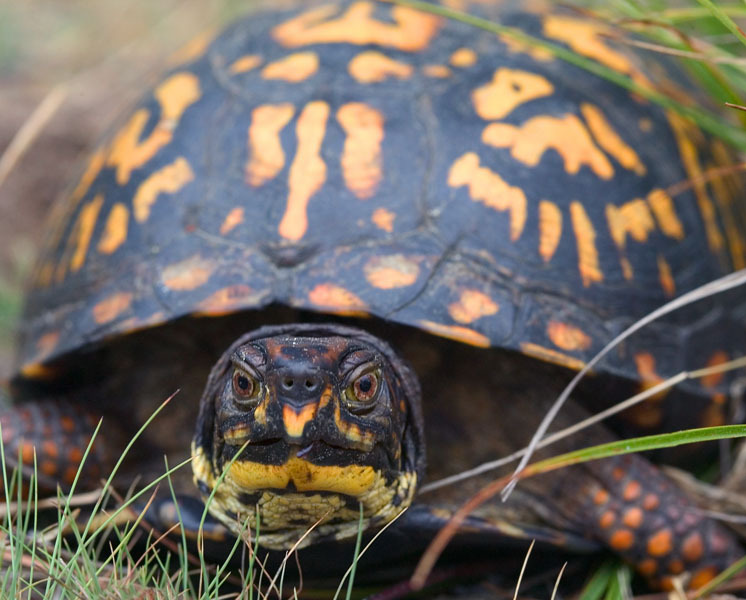 I saw one box turtle making its way toward a busy roadway not too long ago. I picked it up and gave it an aerial view of what was up ahead and hoped that it would see all the cars. As I laid it down, I spun it around 180 degrees as if to tell it, “Don’t go this way.” What does it do? Shortly after I leave it, it starts heading for the road. What do you do? I said, “Alright man. If you REALLY want across the road, I’m going to help you out.” So I grabbed him, he went in his shell, and we juked and jived our way across the road, dodging semis and cars moving at 60 mph.” I’ll give the turtle the benefit of the doubt, and I’ll believe that it knew about something very important across that roadway, and was trying to communicate to me to transport him across. I’m sure there’s a lot of people out there who laugh at me as I admire such a “primitive” creature, but I’m sure none of you could design that turtle, or even build a robot which could do anywhere near what it can do. I dare you to try. That’s a complex creature there. Do you understand optics well enough to design those eyeballs? Do you understand stereoscopic vision well enough to link to the two eyes together and give the creature awareness of depth? If we were to use Feynman’s definition of understanding, I doubt any of us understand that turtle. It took evolution billions of years to make it. We should have respect for the life around us if only for the fact that it’s all much older than we are, and the natural order of this Earth has been around for longer than we can even imagine. We’d be wise not to lay waste to it so quickly to throw up another shopping center. Animals’ reactions to heights showed an intriguing cognitive element: “hesitation” (Thorndike, 1899, p. 284), “uneasiness when on the edge of a void” (Small, 1899, p. 93), “acting as though he feared to attempt such a dangerous feat” (Watson, 1903, p. 40). In his study of diverse animals’ responses to the “sense of support” provided by a surface, Wesley Mills (1898, p. 150) observed that, for many species, “even on the first day of birth they will not creep off a surface on which they rest, if elevated some little distance above the ground. When they approach the edge, they manifest hesitation, grasp with their claws or otherwise attempt to prevent themselves falling, and, it may be, cry out, giving evidence of some profound disturbance in their nervous system.” The only animal that seemed to have no hesitation at any height was a water tortoise, likely because it was almost always above water. Such ecological factors clearly influence animals’ responses to heights: tortoise species that live in water tend to push off heights regardless of visual experience, those that live on land show great hesitation or resistance to pushing off heights and less likelihood of doing so when blindfolded than when not, and those that live on land and water exhibit behavior either somewhat in between the other two types or like tortoises that live on land (Yerkes, 1904). “And so, strange as it may seem, the ‘spatial worth’ of sense data, as James would call it, is no more a matter of accurate knowledge than is the development of the sense of space, or [than are] the modes of behavior in different spatial conditions exhibited by the animal” (p. 17). Land turtles have had time to evolve a fear of heights, but water turtles, who rarely come up on land, have no fear of heights. Underwater they don’t have to worry about those sorts of things, so if you were to put them up on a high cliff, I suppose they’d walk right off without thinking. They’re not aware of the danger. I guess technically you could say other creatures aren’t “aware” of the dangers either; their nervous systems simply put fear in them as they approach the cliff as a programmed response. As humans, we seem to have the programmed response built in our nervous systems to fear heights, but we can also learn about the dangers as well. All creatures which have an awareness of their surroundings acquired it through natural selection. Step by step, each species gradually acquired greater and greater awareness of its surroundings. The predator / prey model greatly accelerates this development as an arms race breaks out between species. By killing off the weak links, only the better models survive, so their senses become more and more keen. There’s two main characteristics of environmental awareness. The first is the ability to filter out sensations which are neither harmful nor helpful. They’re just useless noise. Second is the ability to notice and properly react to helpful and harmful stimuli. If there’s a predator you have to properly react or run away. If there’s a food source, or drinking water, you need to make your way there and get something to eat or drink. So different creatures have evolved different mechanisms to survive, and subsequently, since their nervous systems develop alongside all of this, each species seems to exist on its own “path” to environmental awareness. As we saw, water turtles can’t perceive various environmental threats, such as high precipices. Other land based creatures are born with such a fear instinctively wired into them. It seems that there’s a trade-off. Environmental awareness is costly. It requires a big brain which has to do all this computation work, which requires food and energy. Evolution gives each species the minimum level of awareness necessary in order for it to survive in whatever environment its in at the time. They’re given no more, and no less. If additional awareness helps them secure food, stay alive, and reproduce better, then they get it. If it’s not needed, they remain where they are. Also, the brain isn’t exactly nanotechnology. It operates on microscopic principles, but it’s kind of clunky as well. It’s not that I could design a better brain, but I’m just saying that all that brain matter requires a lot of skull space and uses a lot of energy. An animal needs a lot of food to keep those neural cells alive and in operation. I believe memory developed as a means to avoid predators and be aware of dangers that aren’t immediately apparent. Even if the predator walks behind a corner, you still need to be aware that you’re in danger. Apparently birds have never developed a lot of these abilities. They’re more reactive to what’s immediately in front of them. I don’t know if this is true of all birds, or not. I still have so much to learn. I talked about wasps on here the other day. Their memory is very limited. For instance, they remember where they laid a dead caterpillar down, but if you move it, they’re not adaptive enough to figure out what’s changed. They start back up in their little mechanical routine, fly up in the air, and so on. Slowly and steadily, I’m piecing together how our awareness of time and space developed. Time requires changes in the states of objects in space, so to have time and space requires objects within both! This naturally leads to how brains came to awareness of the objects in the environment. Our awareness comes from processing the changes in touch, sounds we hear with our ears, and changes in contrasts in color in the objects we see. We can smell and taste objects as well, but our primary environmental awareness comes from sight, sound, and touch, in that order. (I think anyway). The general direction I’m heading in is to study how all these different animals think and behave, and hopefully get an idea into how they form representations of their environments and process “thought”. I think thought has evolved as a means of avoiding predators and finding food, so I won’t be surprised if I find the underlying brain functions revolving around those activities. Once I get a more razor sharp understanding into what thought is, and how my brain works, I hope to apply that toward some of the problems in physics, and maybe it’ll help me unravel some of those difficult problems that are confusing everyone. I have 3 aquatic pet turtles (Red Eared Slider; standard pet shop variety) and i have noticed and often wondered why they have absolutely no fear of heights. I have to keep my hand constantly on their shell when they’re on my lap or they’ll just run off and fall. I have noticed one thing that your quotes do not mention. My turtles will sometimes look down from a high place for a few seconds but it won’t deter them and they’ll still fling themselves off. They’re very much like lemmings!